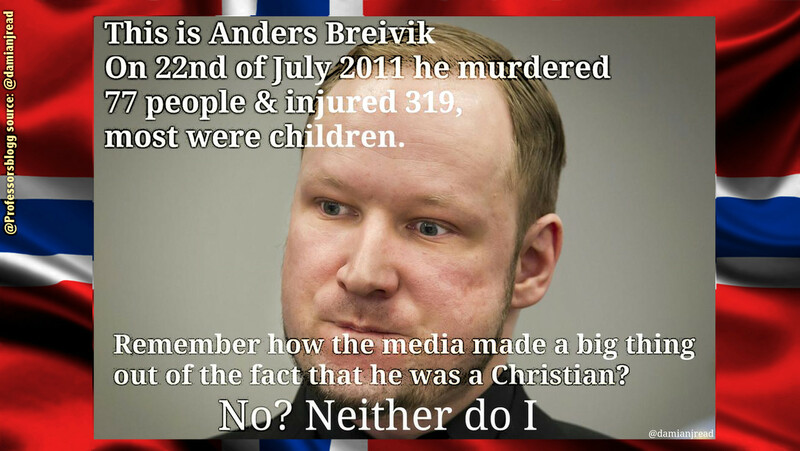 Breivik, a Christian terrorist, murdered 77 & injured 319. No one shall blame all Christians-believers because Anders Breivik, a terrorist auto-defined as Christian, murdered 77 & injured 319. The dramatic events in Paris January 2014 which initiated with the killing of 10 staff and 2 police officers at the Charlie Hebdo Magazine, have also resulted in a sequelae of misconceptions on issues mixing religion, faith, nationality and or ideology of the perpetrators. This confusions are deplorable, firstly because it has the tendency to divert a legitimate indignated public opinion against cultural Muslims or religious groups as a whole, that nothing has to do with the terrorists deeds, their actors or ideas. Secondly, because this confusion, intentionally spread in social media by Muslim haters – and in some MSM by journalists promoters of an anti-immigrant agenda – could also be leading to unfounded protests by infuriated people; or in worst cases leading to terrorists acts against buildings or institutions associated with the Muslim community in Europe (as it has happened). In reacting against the condemnation of “all Muslims” that some in social media have dangerously indulged to, I posted a Tweeter based in a text by @damianjread, that put in evidence the absurdness of blaming a whole group of believers pertaining to the same faith than the terrorist-perpetrator. This in its turn occasioned a debate on whether Breivik could be considered as a Christian at all. Many comments to @Professorsblogg insisted on that Breivik not only “acted alone” (which is seemingly true), but he was NOT a Christian, Some conceded that he has been “born” in a Lutheran family but that he was in fact atheists, or “pure Nazi”. But Breivik was not only a “self-confessed” and self-confirmed Christian, he also strongly advocates for the Catholic Church shall be recognized as the one and only. …A majority of Protestants, me included, has lost all respect for the Protestant church. An increasing number of European Protestants is converting to Catholicism. Only by turning to Rome may Protestants be able to see some of the shortcomings of our espoused faith. Catholicism is far “richer” than anything Protestantism can offer, since only Rome can lay claim to apostolic succession and living Tradition as an infallible guide to interpreting Holy Writ. Only Rome is the true church, since only Rome can lay claim to apostolic succession dating back to Peter, the rock, per the sixteenth chapter of Matthew (“…you are Peter and upon this rock I will build my church…”). Only the Roman Catholic Church is rooted and grounded in this ancient apostolic tradition. Thus, there is no fully Christian church but the one that was there from the beginning. By cutting itself off from this unbroken chain of succession dating back to Peter, Protestantism was adrift from the beginning. And given the maturity of the “Mother Church”, the Protestant Reformation was really nothing more than a kind of teenage rebellion. Christ left a Church, not a book, and then the Protestant doctrine of Sola Scriptura (by scripture alone) is illogical because the formation of the canon (i.e. what we recognise as Scripture) was itself a monumental act of the church. Thus, the Bible requires an infallible church. When a just and conservative Pope mounts the chair of Peter, the tide will set strongly toward Rome. We will hear of conversions on every hand. The joyful radiance of this Pope’s appearance among us will be seen as nothing less than a strong and just knight of Christianity. A Crusader Pope, a man who symbolises and protects the persecuted Church. This new Pope will be a defender of Christianity, and will not contribute to the annihilation of Christendom through suicidal humanism.